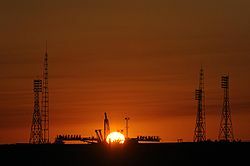 The Baikonur Cosmodrome ( ; ), also called Tyuratam, is the world's first and largest operational space launch facility. It is located in the desert steppes of Kazakhstan , about east of the Aral Sea , north of the Syr Darya river, near Tyuratam railway station, at 90 metres above sea level. The facility derives its name from a wider area known as Baikonur and is also traditionally linked with the town of Jezkazgan . It is leased by the Kazakh government to Russia (currently until 2050) and is managed jointly by the Russian Federal Space Agency and the Russian Space Forces. The shape of the area leased is an ellipse, measuring 90 kilometres east-west by 85 kilometres north-south, with the cosmodrome at the centre. It was originally built by the Soviet Union in the late 1950s as the base of operations for its ambitious space program. With the fall of Soviet Union, the Russian Space Program has fallen into decline, but Baikonur remains central to international space ambitions. Vostok 1, the first manned spacecraft in human history, was launched from one of Baikonur's launch pads, which is presently known as Gagarin's Start . Russian sources have claimed the name "Baikonur" was chosen to misdirect the West to Baikonur , a mining town about northeast of the launch center, near Jezkazgan . "Baikonur" may also refer to the entire region . In the Kazakh language, Tyuratam means "broken arrow", which would seem obvious as a reason why it was not used as the public name of the launch site. For whatever reason, the name of "Baikonur Cosmodrome" became official when the nearby town of Leninsk, was renamed to Baikonur by Boris Yeltsin on December 20, 1995. Baikonur was founded on June 2, 1955. It was originally built as a long-range-missile center and later expanded to include launch facilities for space flight. Sergei Korolev, the Chief Designer of the Soviet R-7 Semyorka ICBM, selected the site, as the radio control system of the rocket required a ground station several hundred kilometres down range of the launch pads. The expense of constructing the launch facilities and the several hundred kilometres of new road and train lines made the Cosmodrome one of the most costly infrastructure projects the Soviets undertook. A supporting town was built around the facility to provide housing, schools and support infrastructure for workers. It was raised to city status in 1966 and named Leninsk . The Soviet government established the Nauchno-Issledovatel’skii Ispytatel’nyi Poligon N.5 (NIIIP-5), or Scientific-Research Test Range N.5, by its decree of 12 February 1955. The U-2 high-altitude reconnaissance plane found and photographed the Tyuratam missile test range (cosmodrome Baikonur) for the first time on 5 August 1957. See a composite satellite image of the early Tyuratam launch complex, the cosmodrome (30 May 1962). Many historic flights lifted off from Baikonur: the first operational ICBM; the first man-made satellite, Sputnik 1, on October 4, 1957; the first spacecraft to travel close to the Moon, Luna 1, on January 2 1959 ; the first manned orbital flight by Yuri Gagarin on April 12, 1961; and the flight of the first woman in space, Valentina Tereshkova, in 1963. 14 cosmonauts of 13 other nations, such as Czechoslovakia , East Germany and France , started their historical journeys from here as well under Interkosmos program. In 1960, a prototype R-16 ICBM exploded before launch , killing over 100 people. Following the breakup of the Soviet Union in 1991 the Russian space program continued to operate from Baikonur under the auspices of the Commonwealth of Independent States. In 1995, the city surrounding the spaceport was renamed Baikonur. On June 8, 2005 the Russian Federation Council ratified an agreement between Russia and Kazakhstan extending Russia’s rent term of the spaceport until 2050. The rent price - which is fixed at 115 million US dollars per year - is the source of a long-running dispute between the two countries. That dispute has prompted Russia to begin upgrading its own Plesetsk Cosmodrome in the Arkhangelsk Oblast of Northern Russia as a fallback option. Baikonur is fully equipped with facilities for launching both manned and unmanned space vehicles. It supports several generations of Russian spacecraft: Soyuz, Proton, Tsyklon, Dnepr, Zenit and Buran. During the temporary lapse of the United States ' Space Shuttle program after the Columbia Disaster in 2003 it played an essential role in operating and resupplying of the International Space Station with Soyuz and Progress spacecraft. Downrange from the launchpad, spent launch equipment is dropped directly on the ground where it is salvaged by the workers and by the local population. Although Baikonur has always been known around the world as the launch site of Russia's space missions, from its outset in 1955 and until the collapse of the USSR in 1991, the primary purpose of this center was to test liquid-fueled ballistic missiles. The official (and secret) name of the center was State Test Range No. 5 or 5 GIK. It remained under control of the Soviet and Russian Ministry of Defense until the second half of the 1990s, when the Russian civilian space agency and its industrial contractors started taking over individual facilities. In 2006, the head of Roskosmos, Anatoly Perminov said the last Russian military personnel would be removed from the Baikonur facility by 2007. However, on Oct. 22 2008 an SS-19 Stiletto missile was test fired from Baikonur, indicating this may not be the case. On December 22, 2004, Kazakhstan and Russia signed a contract establishing the "Russia-Kazakhstan Baiterek JV" joint venture, in which each country holds a 50-percent stake. The goal of the project is the construction of the Bayterek (poplar tree) space launch complex, to facilitate operations of the Russian Angara rocket launcher. The site is scheduled to be completed in 2009.This will allow launches with a payload of 26 tons to low earth orbit, compared to 20 tons using the Proton system. An additional benefit will be that the Angara uses kerosene and oxygen as fuel, which is less hazardous to the environment than the toxic fuels used by older boosters. The total expenditure on the Kazakhstani side will be $223 million over 19 years. Baikonur Cosmodrome historical note (in Russian) and historical pictures (2002) on buran.ru - NPO Molniya , maker of Russian space shuttle Buran.